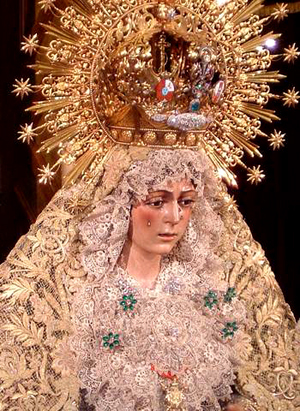 Just as there is no Spain without a love for Our Lady, there is no Holy Week in Seville without La Macarena, Our Hope. 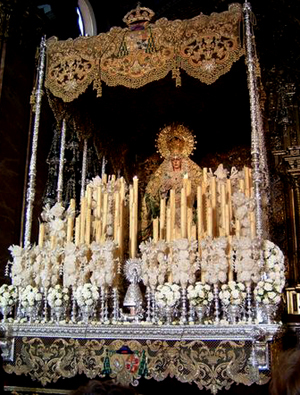 The people call her the most beautiful Virgin of Seville and of Spain. 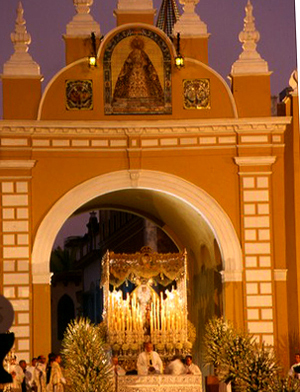 Since the 17th century, La Macarena has held the place of honor in the magnificent Holy Week processions that have made Seville famous. 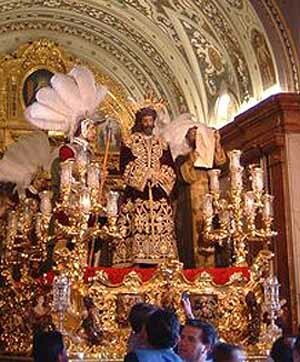 During the seven days before Easter, the main streets of Seville close to the normal traffic and street din. The mundane world seems to stop, and all eyes turn to the scenes of the Passion and Death of Our Lord Jesus Christ and the suffering of His Holy Mother. 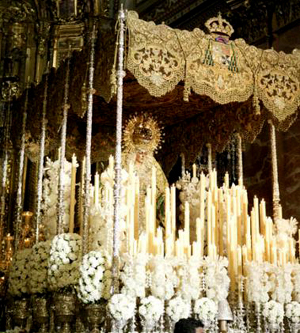 For seven days and nights, 58 processions with 116 large platforms with life-sized images portraying different episodes of the Passion traverse the streets of Seville. They are massive floats, carried by as many as 60 porters, who, hidden from view by velvet curtains, shuffle along, unable to see, directed by the commands of their leader outside. The processions are accompanied by great crowds of people not just from Seville, but pilgrims around the world. 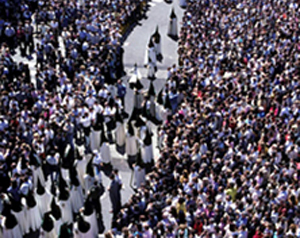 Each year finds more and more Americans among those pious crowds. 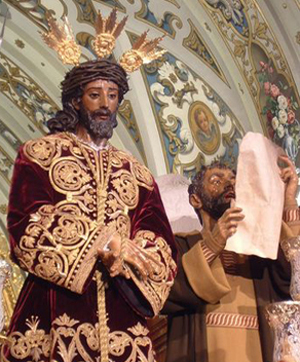 We come seeking to share the fervor and national enthusiasm for the pious exercises of Holy Week of old Catholic Spain, which revives each Holy Week despite the protests of the liberal government and Progressivist Church. For 400 years, each Good Friday, one of the most expressive processions of all Holy Week is repeated: the procession of La Macarena. It begins at midnight and lasts 12 hours. Crowds of people stand outside the old Arab ramparts waiting for the door of the Basilica of the Macarena to open so they might greet their Queen. The night air is perfumed with orange blossoms and thick with expectation. Finally, the silver-plated cross that precedes the largest and most famous procession of Holy Week in Seville appears. 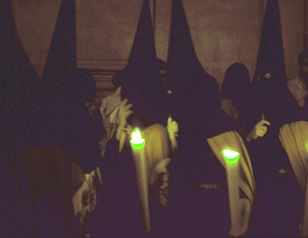 Then the penitents advance in a long double row, sweeping by with an air of mystery in their long white robes, their faces hidden by tall black pointed hoods broken only by two slits for the eyes. The hoods can seem frightening to Americans, who are unaccustomed to this ceremonious garb. This garb dates to the late Middle Ages and has a charitable purpose: the hoods provide anonymity to the penitents. These penitents consider themselves very privileged to belong to the Cofradia, or Confraternity, of the Macarena, one of the most illustrious that was founded in 1595 and counts members of the Royal Family in its numbers. The first platform that appears is that of Christ Sentenced. Dressed in a richly brocaded scarlet robe, His hands are tied before Him. He stands in the presence of Pilate and others who listen to the reading of the sentence of the Jewish high priest. The scene is intended to move the viewers to compassion. Our Lord in all His beauty and royalty is condemned to death. The Americans in the crowds begin to better comprehend the reason for the penitents who march in front of the pasos, or floats. We want to join them – to make penance for our indifference, our ingratitude, our sins that condemned Our Lord to the ignoble death of the cross. Then, finally, she appears on the second platform ornamented with silver and flowers. It is La Macarena, the most popular Virgin in the Land of Mary Most Holy. A multitude of lighted wax tapers are placed on the platform before Our Lady so that their glare will keep Our Lady from seeing the torments of her Divine Son. They also shed incandescent light on the magnificently arrayed life-sized image of the Virgin. The crystal tears shine on her face, tender and sorrowful. “Viva la Macarena!” the people shout. The enthusiastic crowd greets her. Women weep. Men beat their breast with their fists. Even the most phlegmatic cannot help but be caught up in the wave of fervor. Some of the more daring try to touch her garment or take a petal from the flowers that adorn the platform as a sacred memento of their beloved Mother. From midnight to noon, she walks the streets of Seville. 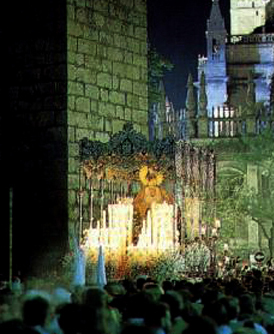 At times the processions halts to the refrains of a saeta, a wailing song of sorrow and repentance that pierces the night air. These songs are composed extemporaneously by the people to console Our Lord and Our Lady who suffer for our sins. It is something unimaginable for Americans: this open, expressive manifestation of the sorrow and love of a people for their Heavenly Queen. Without human respect, women weep; a man composes a melodious song of reparation and sings it in the street; lines of penitents carry heavy wax candles or instruments of penance to expiate their sins. It is something enviable: we long for the day when our country will acknowledge the sufferings and triumphs of Our Lord and Our Lady as we should. No one knows for sure the origin of La Macarena. Some say it is the work of the 17th-century sculptor La Roldana; others insist it is the work of angels. One notices a bruise on the right cheek of the lifelike image. This was not painted by any artist. During one of the Holy Week processions, a drunkard in the crowd shouted insults at Our Lady and finally threw a glass bottle at her, hitting her cheek. It left the bruise that is still visible today. Many artists have tried to repair the damage to the cheek but each time, as soon as the restoration was completed, the bruise would return as if newly made. When the man who committed this terrible offense against the Mother of God became sober, he saw the bruise and repented for his crime. For his penance, he resolved to walk before the statue each Holy Week with chains on his feet and carrying a cross to expiate his sin. After his death, his descendants continued this practice. To this day, it is said, a family member continues this act. It is a marvelous example of the reparation of a family for the sin of one of its members. An example from the late 1970s demonstrates the love and fidelity of the people. At that time, a campaign was undertaken to raise money among the wealthy and noble families of Seville to acquire a new outfit for La Macarena. The subscription raised a good sum, amounting to about $70,000. But then the socialist faction that was assuming power in the city after the death of Franco began to protest that this money should be given to one of the poorest barrios of Seville where unemployment was high. The liberals insisted and won the day. But the story does not end there. The poor barrio that received the money responded with a truly gallant gesture. They made their own campaign and raised another $25,000 for La Macarena. Adding this to the $70,000, they purchased a magnificent new outfit for their Queen and Patroness. It is a beautiful story. The poor accepted the gift that had been robbed from their Queen, added all they could to it, and returned it to their Heavenly Patroness. They understood that the highest order of the day was the glory of God and His Mother. They preferred to offer Our Lady a magnificent gift and earn eternal glory rather than to use the money for social interests and brief earthly comforts. In this expressive act of generosity, we glimpse the great intimacy that exists between Our Lady and a Catholic people. 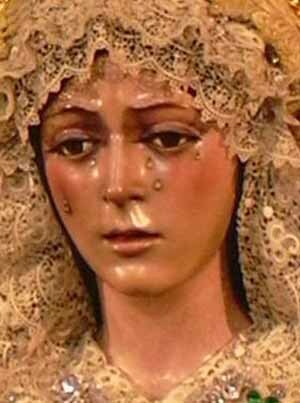 Why do the Spanish people love this beautiful image of the weeping Virgin? They are her children, and her tears do not repel them or make them want to flee her sadness and deep suffering. Rather, her tears inspire her children to comfort her. I have the feeling that if we would acquire a bit more of this Catholic spirit we would have statues like this in the United States. We should ask La Macarena, our Hope, to give us this truly Catholic spirit.